I love birthdays. Not just my own either - any reason to eat cake, have a few drinks and celebrate is A-OK in my book. And this weekend, Jack turns 23! Time to celebrate! To Jack, his birthday means one thing - food. The only thing he asked for this year? 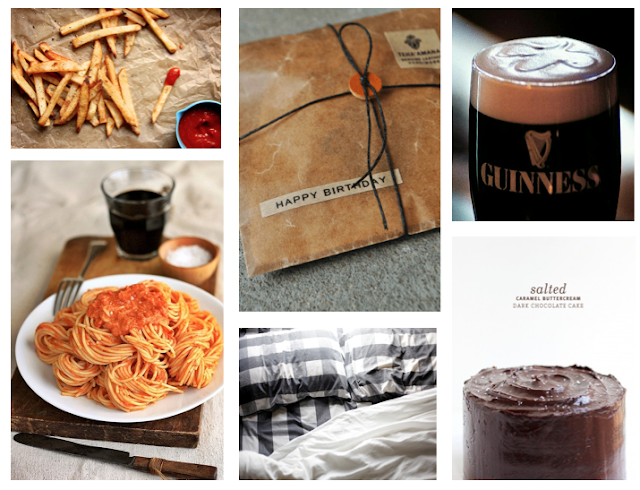 Spaghetti and meat balls, french fries and chocolate cake. A Guinness would be nice, too. And sleeping in. While he's fine with a home-cooked dinner, a little bit of relaxation and no presents, I have a few surprises up my sleeve. AND IT'S KILLING ME! Ask my mom, I am the WORST when it comes to keeping secrets...it's truly amazing I've kept Jack's birthday presents a secret for this long! So while I still have a few days to sit and wait in insurmountable anticipation, here's a little sneak peek into his birthday weekend!